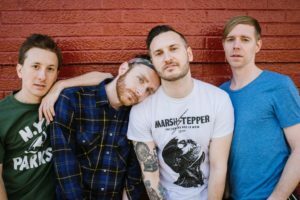 I chatted with Dylan from the band Bear Hands about their music and the challenges of touring. Ted and I attended Wesleyan University together. We were experimenting together musically when we met the rest of the band. That’s tough. I will say that my favorite to perform is “Bone Digger.” It’s definitely a crowd pleaser! Q: What is the most challenging part of being on the road? Q: Do you think social media helps or hurts the music industry? I’m sure it’s helped in a lot of ways. For instance, you can communicate with your fans easier. It can be a chore I guess, but you can meet and network with some cool people. The music. ::laughs:: I generally never listen to our stuff outside of performing it. It’s also a great time to interact with your fans. I love the feeling of being on stage and hearing the drums in my chest. Q: Are you excited about performing this Sunday at DC 101’s Kerfluffle? We are! I can’t wait to see Blink 182 perform honestly. I heard I’m going to love the venue! 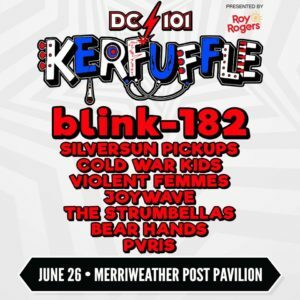 Bear Hands performs this Sunday at DC 101’s Kerfluffle, which takes place at Merriweather!